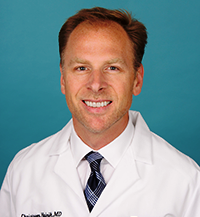 Dr. Hajnik was raised on the Central Coast of California and earned his Bachelor of Science degree from the University of Notre Dame in 1994. During his senior year at Notre Dame, he was honored with “All-American” distinction while serving as captain of the NCAA National Champion fencing team. He continued his education at Notre Dame, later earning a Master of Science Degree in Biology. he then moved to Philadelphia, where he received his medical training at Jefferson Medical College. After medical school, he completed his orthopaedic surgery residency at Loyola University Medical Center outside of Chicago, followed by sub-specialty fellowship training at the world-renowned Insall Scott Kelly Institute in New York City. Dr. Hajnik returned to California in 2010, where he joined CORE Orthopaedic Medical Center as a specialist in Adult Joint Reconstruction. His sub-specialty interests include primary and revision joint replacement of the hip and knee, unicompartmental arthroplasty, cartilage restoration surgery, and surgery of the knee. He has presented multiple lectures and authored several textbook chapters on these subjects, and his active professional memberships include the International Congress of Joint Reconstruction, the American Academy of Orthopaedic Surgeons, and the Insall Club. Dr. Hajnik resides in Encinitas with his very patient wife, Vanessa, and their two daughters, Mia and Isla. During his limited spare time, Dr. Hajnik loves college football and golf, and now that he has finally returned to his beloved California coast, he is also looking forward to renewing his interest in scuba diving.